I loved this book – and by that I mean the physical book. The texture, the colors, the drawings and the fact that it glows in the dark are among the things that would be lost were it an eBook. Radioactive must be touched, felt, and seen. Really, it GLOWS in the dark. The information in the book reads like observations and fun facts distributed among the drawings. 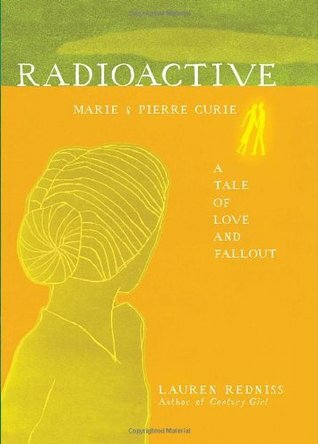 It conveys the story of Marie & Pierre Curie in a whimsical, almost lyrical prose. Sometimes it seems almost like a poem; sometimes it feels like a scrapbook put together by a very meticulous girl. In spite of that, the information is very much grown-up and smart. It is fun and poetic but is also covers serious subjects. One can’t really talk about the Currie’s without talking about radioactivity. The book covers science clearly & without embellishment. Radium, chemistry, physics, and cancer are all discussed. The personal toll that their discovery took also unfolds. The Currie’s isolation of radium was both their triumph & their demise. Since they were the first to isolate Radium, they did not know the deadly consequences of touching it and breathing its “dust.” Their work resulted in Nobel Prizes but also cancer and death. The story of their lives is told parallel to world events and other discoveries. Their work made possible the development of X-rays but it also resulted in the development of the atomic and nuclear weapons we have today. If I had a daughter of 10-plus years, I would put this book in her hands. Marie Currie is a great role model. She was a brilliant, strong, and independent woman who, against all odds, became a physicist and won two Nobel Prizes. As a book for teen and preteen girls, I give it 5 stars. For the rest of us, I give it 4 stars. It is not great literature but it is charming and creative in conveying a story of ordinary people who accomplished extraordinary objectives. More than just the words, the art, the colors, and the choice of paper each have an important part in this story. Read it, but don’t forget to touch and feel the book. And, for heaven’s sake, do turn the light off so you can see it glow. Categories: Reviews | Tags: book review, Lauren Redniss, literature, Marie Curie, Pierre Curie, role model for girls | Permalink.